In partnership with Carleton University and VisitAble Housing Canada, the Ottawa Chapter of CSC is hosting a panel discussion on March 7. The event enables design/construction professionals to learn from a panel of experts about local initiatives and efforts to ensure universal accessibility. The Okanagan Spirits Craft Distillery has added a new 1553-m2 (16,720-sf) custom built pre-engineered steel building to its existing storage facility in Vernon, British Columbia. Spirits are flowing thanks to a Kelowna-based steel building company that has helped a local craft distillery expand its storage facilities. 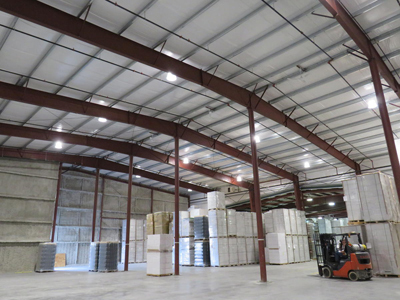 The 1553 m2 (16,720 sf) steel structure in Vernon, British Columbia, has been built as an addition to an existing storage building, which MSC helped retrofit to connect it with the new building. Led by MSC owner Steve Ivanitz and assisted by consultant Rob Penny, MSC worked closely with Okanagan Spirits CEO Tyler Dyck to make sure all specifications and requirements for the building were met before any construction began. With a design plan in hand, MSC worked with Vernon-based Bourcet Engineering in providing the site planning and elevations, and then sent all of its plans to a pre-engineered building fabricator to manufacture the parts. The same manufacturer had fabricated the distillery’s existing storage building. “We wanted the same colours and have a good tie-in, so that both buildings matched and fit with each other. We matched the roof colours and gutters (hunter green), and the sheeting (sandstone) for a seamless look,” says Penny, adding KCW Construction set the concrete foundation. With the main purpose of the building being storage, the 33.5 x 46 m (110 x 152 ft) structure has a 8-m (25-ft) roof clearance inside, allowing for three pallets to be stacked atop one another, while centre row columns made from steel anchored to cement provide a wide-open space. The building also features custom touches, such as a covered loading bay, which features a roof and open walls. MSC also did some roof work on the existing building to match the new building. The R20-rated insulated building also features a fire-rated end wall.